Privacy and publishing settings determine how much personal information will be available and used in communications, however these settings do not apply for award winning designs, if you want complete privacy you should consider Concealed Category participation. Please note that you have to choose privacy settings before you are notified of receiving the award in order for them to be effective. There are several settings as explained before. You can access the privacy settings for your design by visiting them from your hidden cabinet. For highest privacy options, consider joining a concealed category. I do not consent to have my personal information and profile published in the traditional press, publications, online media, A' Design Award & Competition communications and press releases. I also herein by declare that the image I have submitted is my personal image and I have all the copyrights to share. In this case, your design will be published or available online with the designer being an "anonymous participant" if you are a winner. To reinforce this option, please do not upload your personal profile and please do not fill your personal profile completely. If you fill your profile, this option will become void ab initio; i.e. it will not be a valid option since you provide your data, and you cannot change to this setting back afterwards or if you choose this option but later you filled your data, it means you agree to cancel this option and the system will ignore your choice. All: I consent to have my personal information, team members name, personal profile photo, the submitted design and company logo published in the traditional press, publications, online media, A' Design Award & Competition communications and press releases. I herein by declare that I have all the copyrights permissions to share, publish or have these information to be published. In this case your design, your short bio, team members names, your photo and company logo might be published or available online for press members and readers. This is the preferred option for having more press appearances. To reinforce this option, please upload your personal profile and please fill your personal profile completely. Design Only: I consent to have only the submitted design and my name to be published in the traditional press, publications, online media, A' Design Award & Competition communications and press releases. I herein by declare that I have all the copyrights permissions to share, publish or have these information to be published. This option is not suggested. In this case your design and your name might be published or available online. However, your profile image, bio, company logo and team members name and other details are not published. To reinforce this option, please do not upload your personal profile and please do not fill your personal profile completely. Name Only: I consent to have only my name to be published in the traditional press, publications, online media, A' Design Award & Competition communications and press releases. I herein by declare that I have all the copyrights permissions to share, publish or have these information to be published. This option is not suggested, however you might need it in case you want to apply for a patents for your design, this option works only for concealed categories, please ensure to apply your design for one of the concealed categories, or request your entry to be nominated for one of the concealed categories. If you choose this option, we will not publish any information, however occasionally, it could be possible that we only have your name published and communicated in the press releases but we will not send your designs to press, nor your designs will be available online or any other publications. Good to Know: Unless you opt-out in written form within 15 days of award status, the default option will change to complete publication regardless of what you have chosen initially (except for Concealed Category entries), this rule was put in place to ensure that you get the most out of your award status; publicity and dissemination. 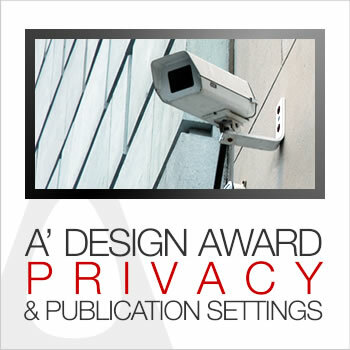 In addition to privacy settings for entrants, the A' Design Award and Competition has Concealed Categories which is a perfect option for privacy and secrecy for award winning works.